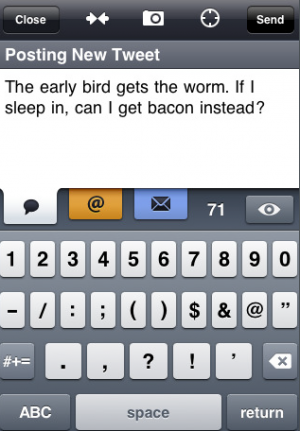 During the past several months, a war has been brewing between Twitter apps for the iPhone. But it’s been largely two-sided. You were either in the Twitterfon camp or the Tweetie camp. And if you were using any other app, it was only because you didn’t know any better. But with the release of Twitterrific 2.0 [iTunes link] for the iPhone, a new player has entered the fray. Twitterrific was one of the original iPhone Twitter apps. And for a while it was the most popular one. But when newer apps like the Twinkle, Tweetsville and then Twitterfon and Tweetie came along, they just blew it out of the water with either features, speed, or both. And so I was very skeptical when trying out this latest version, thinking there was no way it could replace the two newest gold standards. But after using it for a day, I have to say, I’ve for the most part been won over. The new Twitterrific is great. It adds all the key features that it lacked before: Multiple account support, search and trends, while doing so with a completely redesigned user interface. Previously, I didn’t like how big and clunky tweets looked in Twitterific, but the new version allows you to easily change the size of your tweet stream depending on how many tweets you want to see on one screen. It also allows you to change the theme from dark to medium to light. The new Twitterrific also adds an amazing amount of features, while being able to keep the core functionality of the app simple. This is largely thanks to the filter icon which tucks away @ replies, direct messages and the like. Also in that area, you’ll find what I think is one of the key advantages the app has over its rivals: The ability to bookmark tweets to look at later (which is separate from favoriting tweets). You also take and save notes on various users. There are also a ton of options that can be set in the settings menu, such as which photo service to upload pictures to. And the ability to add Instapaper bookmarking support, just like Tweetie offers. You can also set the app to be better suited for left-handed people, set what tapping on an avatar does (as well as set what double and triple tapping does), and a whole host of other things. But the most important element to me for any of these Twitter apps, is speed. Previously, Twitterrific seemed downright slow when compared to some of its newer rivals. But the new version is much faster — but it’s still not quite as fast as Tweetie . But it has some nice options to make this less of an issue, including the ability to set auto-refresh intervals for your tweet stream. Unfortunately, I have gotten a number of API timeouts when trying to refresh my stream too often, but that’s likely at least as much of Twitter’s own fault. After initially taking the Twitterfon side, for the past few months I’ve been a Tweetie convert. It is simply a hard app to beat in terms of features, ease of use and design. The main downside is that it is a paid app (while Twitterfon is free). Because of this, Tweetie started as more of a Twitter power user tool. 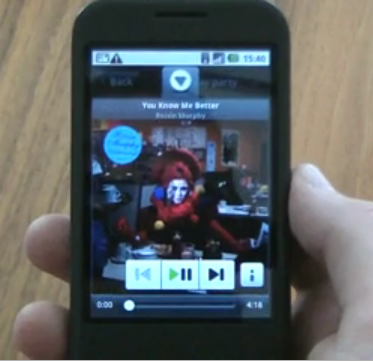 But by word of mouth it has spread quickly and grown into a huge app. So big that the developer even made a desktop version for the Mac. But this new version of Twitterific (which also has a desktop app too), is a worthy challenger to the throne. Smartly, it’s creators, The Iconfactory, offer it in either free or paid versions (the premium $3.99 one takes away the in-stream ads). 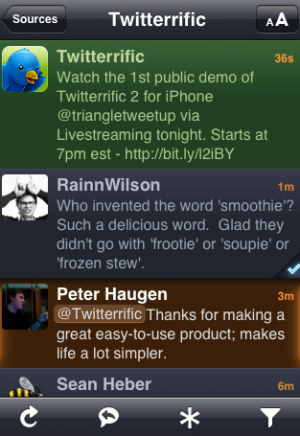 If you want a Twitter client for the iPhone with the most features, Twitterrific is probably for you. For me, it remains to be seen which one I’ll continue to use on a daily basis. Twitterrific’s slightly slower speed may ultimately be the deal-breaker. But if I start bookmarking a lot of tweets, or using some of the other features, I may continue using Twitterrific — even instead of Tweetie.